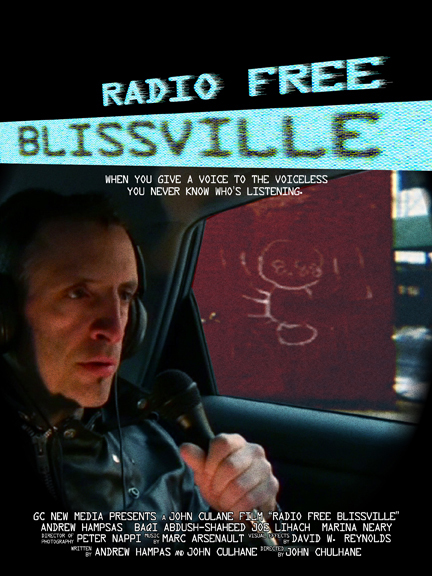 Radio Free Blissville is a short film made in 2009 directed by J.F. Culhane. A version of the short premiered at the Anthology Film Archives NewFilmmakers series in New York City. Â It is the starting point of a longer feature project calledÂ Transmission888. NOTE: This short should be played on decent speakers or listened to via headphones for the full effect. Radio Free Blissville follows a quixotic pirate radio cult in a post information city called Blissville where internet and satellite communications have been compromised. A leader in the movement is the crippled Lenox and his faithful driver Stu who broadcast from a roving car. They endlessly circle neighborhoods and districts, reading dedications, playing uplifting music, doing on the spot interviews, and passing along pertinent information to their community until their power or sanity runs out.